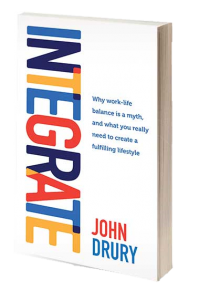 John Drury is a Mentor and Author who is passionate about helping high achievers fulfil their potential across their whole life. To enable you to successfully INTEGRATE your busy work roles with ALL that is important in your world. AND their families. Work-life balance is a myth especially when you are passionate about your work. danger is that anyone can experience burnout. No-one is exempt. control. It is important to ensure you are making your role work for you. not everyone else. After you have been in business for a while, It's difficult to find a business mentor that truely adds real worth. John was one someone of real worth for us.